Belize NMS: Mainly warm weather prevails, but a weak cold front approaching will bring a few changes today. 24-hour forecast: Sunny with cloudy periods today and partly cloudy skies tonight.Isolated showers will occur with the chance for an isolated afternoon thunderstorm inland. Today: Winds: East 5-15 kts. ; seas: Light chop - choppy. ; waves: 1-3 ft.; isolated showers. Marine Outlook: Friday night:- winds: East 5-15 kts. ; seas: Choppy; waves: 2-4 ft.; isolated showers. General Outlook: Through to Saturday morning: Cloudy spells with isolated showers and the chance for an isolated afternoon thunderstorm inland or in the north. On Ambergris Caye this morning we have ESE at 6mph, calm sea, clear sky and the expected high is 87. Nice! One small area of rain early this morning way out at sea, otherwise very clear. 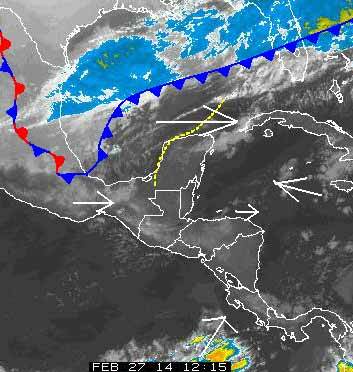 . . . . That cold front may cause a bit of clouding over part of Belize. Unlikely to cause any rain, but it could, depending just how near it gets today.